(October 30, 2011) FORT LAUDERDALE, FL - THE BAHAMAS MAKES BIG WAVES AT INTERNATIONAL BOAT SHOW - The large and impressive presence of The Islands Of The Bahamas at the Fort Lauderdale International Boat Show, over the weekend, October 27th through 31st, has garnered the country immeasurable publicity and exposure. 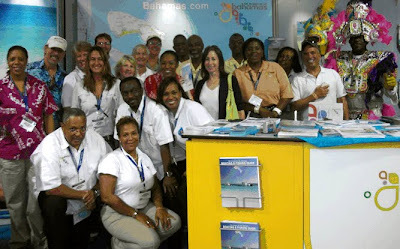 The Bahamas representation of about thirty included, the boating team of The Bahamas Ministry Of Tourism and Aviation, the Grand Bahama and Bahamas Out Island Promotion Boards, The Marina Operators of The Bahamas, The Bahamas Dive Association, the country’s national flag carrier, Bahamasair and a costumed Junkanoo artisan. Fort Lauderdale ‘s International Boat show is said to be the largest in the U.S. and one of the largest in the world and over the weekend, more than 150,000 boating enthusiasts from Florida, across the country and from around the world, were expected to be in attendance. With the signature smile and warmth that the country is known for, The Bahamas ‘contingent were all in one accord with the greeting extended to the crowds of show attendees visiting their extensive booth. 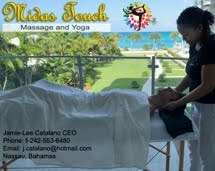 Each member of the team shared from an individual perspective an identical message – the close proximity of The Islands to the Southern U.S. mainland; the multiplicity and diversity of Islands (accommodations, amenities, attractions and unique culture), and the excitement, adventure and unparalleled beauty awaiting visitors to the sun kissed shores of The Bahamas. Above a portion of The Bahamas’ team allow a few seconds away from their busy booths for this group shot.